So many researchers, historians, scholars, and anti-Mormon groups have copied and circulated and posted this letter on the internet that it may have inadvertently become the most well-known and widely-read piece of private correspondence ever written by a General Authority. Because it is frank and uncompromisingly direct with counsel on how to approach the Adam-God theory and other false doctrines, a lengthy excerpt from it is given below in company with other like materials written by Elder McConkie. Some instruction about how Adam was born are also included and blend well with the subject. Adam was born into the world; that is the way he had to get here. The rib story is as much as people are able to receive and it’s figurative as is the dust of the earth story. I was made of the dust of the earth, and so was Adam. The way I was made of the dust of the earth was for my mother to partake of the elements of the earth in the normal birth process…. Question: Was Adam transplanted as a physical being from another planet? And if he was not transplanted, then do we take the creation account mentioned in the Pearl of Great Price literal or do we take Brigham Young’s statement as he mentioned in the Journal of Discourses as merely his own opinion, or as scripture? Answer: Adam was a spirit son of God like all of us. He lived in preexistence and he came here, and he has lived on one earth and this [earth] is it—and that is what Brigham Young taught—exactly. Except that Brigham Young had the faculty of disagreeing with himself. He said also the other [about Adam being transplanted]. All you have to have is the wisdom to believe the right quotation that he made. The right quotation he made is the one that is in harmony with the scriptures. Answer: God created Adam from the dust of the earth. And God created Bruce McConkie from the dust of the earth. Of this earth. And he did it in precisely the same way. Adam was born into the world. Everybody else was born into the world and all of us are created from the dust of the earth, which is a figurative expression that means that we were born into the world threw the organization of the elements. Now there have been lots of speculation and there will be lots of speculation in the future, but there really isn’t any substantial problem in finding out what the fact is. Once in a while someone says something which is dramatic and it gets preserved and it isn’t true. And he corrects himself and he edits himself but he can’t recall the thing that he said. And someone always wants to believe some dramatic or unusual thing for some reason of personal satisfaction. Our experience is that the overwhelming majority of people who become seriously entangled in the Adam-God maze are people who are living in sin. In such cases the only course of redemption is one of repentance and return to the standards of truth.… Our experience also is, that if people have been simply intellectually enamored with the Adam-God philosophies and have not dropped into the quagmire of sin, it is an easy thing to straighten out their thinking and have them return to sound principles. However, those whose lives are out of harmony with church standards, become fanatical, sometimes almost glassy eyed, in presenting their theories and they feel disposed to adhere to them in spite of truth, reason, logic or anything else. I assume you are sufficiently aware of what goes on in the church to know that I would have a working familiarity with all of the statements of the early Brethren that are in any way related to this so-called doctrine. The likelihood is that I am aware of and have access to much more in the field than you do…. 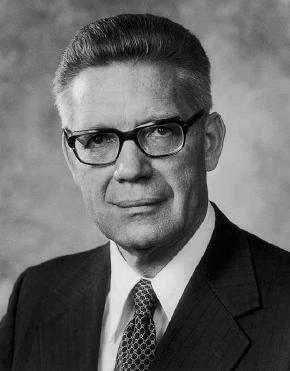 What is more important than this however, is that I know what the scriptures teach on the matter and am aware of the reasoning and have felt the inspiration incident to the decision of President Kimball and others of the Brethren to announce affirmatively that the Church does not believe this doctrine. People with insight and understanding know that one of the main reasons the First Presidency and the Twelve issued their great proclamation and exposition on the nature of the Father and the Son in 1916 was to lay at rest ideas about Adam being our Father and our God. Those with spiritual insight find it a little difficult to believe that individuals can so ardently sustain and support some of the views they do when these views are contrary to the united voice of the First Presidency and the Council of the Twelve upon whom God has given the responsibility to interpret and proclaim the true doctrines of his kingdom. In that same [BYU] devotional speech I said: “there are those who believe or say they believe that Adam is our father and our God, that he is the father of our spirits and our bodies, and that he is the one we worship.” I, of course, indicated the utter absurdity of this doctrine and said it was totally false. Since then I have received violent reactions [by letter] from Ogden Kraut and other cultists in which they have expounded upon the views of Brigham Young and others of the early Brethren relative to Adam. They have plain and clear quotations saying all of the things about Adam which I say are false. The quotations are in our literature and form the basis of a worship system followed by many of the cultists who have been excommunicated from the Church. . . .
Now may I say something for your guidance and enlightenment. If what I am about to say should be taken out of context and published in Dialogue or elsewhere, it would give an entirely erroneous impression and would not properly present the facts. As it happens, I am a great admirer of Brigham Young and a great believer in his doctrinal presentations. He was called of God. He was guided by the Holy Spirit in his teachings in general. He was a mighty prophet. He led Israel the way the Lord wanted his people led. He built on the foundation laid by the Prophet Joseph. He completed his work and has gone on to eternal exaltation. Yes, President Young did teach that Adam was the father of our Spirits, and all the related things that the cultists ascribe to him. This, however, is not true. He expressed views that are out of harmony with the gospel. But, be it known, Brigham Young also taught accurately and correctly, the status and position of Adam in the eternal scheme of things. What I am saying is, that Brigham Young, contradicted Brigham Young, and the issue becomes one of which Brigham Young we will believe. The answer is we will believe the expressions that accord with the teachings in the standard works. I think you can give me credit for having a knowledge of the quotations from Brigham Young relative to Adam, and of knowing what he taught under the subject that has become known as the Adam God Theory. President Joseph Fielding Smith said that Brigham Young will have to make his own explanations on the points there involved. I think you can also give me credit for knowing what Brigham Young said about God progressing. And again, that is something he will have to account for. As for me and my house, we will have the good sense to choose between the divergent teachings of the same man and come up with those that accord with what God has set forth in his eternal plan of salvation. This puts me in mind of Paul’s statement: “There must be also heresies among you, that they which are approved may be made manifest among you.” (1 Cor. 11:19.) I do not know all of the providences of the Lord, but I do know that he permits false doctrine to be taught in and out of the Church and that such teaching is part of the sifting process of mortality. We will be judged by what we believe among other things. If we believe false doctrine, we will be condemned. If that belief is on basic and fundamental things, it will lead us astray and we will lose our souls. This is why Nephi said: “And all those who preach false doctrines,…wo, wo, wo be unto them, saith the Lord God Almighty, for they shall be thrust down to hell!” (2 Ne. 28:15.) This clearly means that people who teach false doctrine in the fundamental and basic things will lose their souls. The nature and kind of being that God is, is one of these fundamentals. I repeat: Brigham Young erred in some of his statements on the nature and kind of being that God is and as to the position of Adam in the plan of salvation, but Brigham Young also taught the truth in these fields on other occasions. And I repeat, that in his instance, he was a great prophet and has gone on to eternal reward. What he did is not a pattern for any of us. If we choose to believe and teach the false portions of his doctrines, we are making an election that will damn us. It should be perfectly evident that under our system of church discipline, it would be anticipated that some others besides Brigham Young would pick up some of his statements and echo them. Those who did this, also on other occasions, taught accurately and properly what the true doctrines of the gospel are. I do not get concerned when a good and sound person who, on the over-all, in teaching the truth happens to err on a particular point and say something in conflict with what he has said himself on a previous occasion. We are all mortal. We are all fallible. We all make mistakes. No single individual all the time is in tune with the Holy Spirit, but I do get concerned when some person or group picks out false statements and makes them the basis of their presentation and theology and thus ends up having a false concept of the doctrine, which in reality, was not in the mind of the person whose quotations they are using. Wise gospel students do not build their philosophies of life on quotations of individuals, even though those quotations come from presidents of the Church. Wise people anchor their doctrine on the Standard Works. When [D&C] Section 20 says that God is infinite and eternal, it means just that and so on through all of the revelations. There is no need to attempt to harmonize conflicting views when some of the views are out of harmony with the Standard Works. This is what life is all about. The Lord is finding out what we will believe in spite of the allurements of the world or the philosophies of men or the seemingly rational and logical explanations that astute people make. We do not solve our problems by getting a statement from the president of the Church or from someone else on the subject. We have been introduced to the gospel; we have the gift of the Holy Ghost; we have the Standard Works and it is our responsibility to get in tune and understand properly what the Lord has revealed and has had us canonize. The end result of this course of personally and individually pursuing light and truth is to reach that millennial state of which the scriptures say it will no longer be necessary for every man to say to his neighbor “know the Lord,” for all shall know him from the greatest to the least. Joseph Smith says this will be by the spirit of revelation. . . . I advise you to take my counsel on the matters here involved. If I err, that is my problem; but in your case if you single out some of these things and make them the center of your philosophy, and end up being wrong, you will lose your soul. One of the side effects of preaching contrary to what the Brethren preach is to get a spirit of rebellion growing up in your heart. This sort of thing cankers the soul spiritually. It drives people out of the Church. It weakens their faith. All of us need all of the faith and strength and spiritual stability we can get to maintain our positions in the Church and to work out our salvation. . . .
As you might surmise I am inundated with a flood of letters and manuscripts which set forth quaint and cranky and bizarre and false doctrines. I seldom read them through to the end and almost never send an answer. It is my practice to discard them because I have neither the time nor the inclination to engage in discussions or debates on doctrinal matters…. I do not see any merit in any presentation that is based on false premises. It is possible to make a seemingly logical presentation “proving” the Adam God theory or “salvation by grace alone” or almost anything. That is not the real issue. We should spend our time sustaining true principles. A man who knows better is very foolish to present false views. I am fully aware that Elden Watson and others have come up with a two-Adams theory for Adam-God which they presented to Elder McConkie and that he seemed to favor for a time, but also seemed to eventually discard. Full examination of that situation is found in the book mentioned in endnote 3 below. A detailed examination of the entire England letter episode is found in Dennis B. Horne, Bruce R. McConkie: Highlights from His Life and Teachings, epilogue for the second edition.